Springtime is the perfect season to renew body and soul. Shower yourself with Spring Specials at Sandalwood Spa! Call us at 805.343.7520 for additional details and appointment availability. The rumors are true! lululemon is now available at Sandalwood Spa! Good things comes to those who sweat. #thesweatlife is how we live day to day, and why not look great doing it? Whether it’s at your favorite yoga class, a trail run, or post-yoga wine with your friends, lululemon has you covered. Select styles and sizes available. Spend an afternoon building an amazing pot of succulents, drinking sangria and enjoying light appetizers on Friday, May 3rd from 1-3PM. Your $55 payment includes a beautiful custom, large pot of succulents, sangria, appetizers, Spa goodie bags, raffle to win Spa treatments and product giveaways. Call 805.343.7520 to RSVP! Treat mom to a luxurious Spa day at Sandalwood Spa with these Mother's Day Specials running the entire month of May! Spending the day with mom at the spa is the perfect gift for her. Book your treatment early as these appointments are subject to availability. Contact Sandalwood Spa at 805.343.7520 to book your treatment today! For more than 4,000 years, the sweet, balsamic incense of sandalwood has been revered for its soothing qualities. Its exotic scent calms and restores, creating a perfect atmosphere for relaxation and meditation. Those same qualities are the inspiration for Sandalwood Spa at the Monarch Club. The Spa is a tranquil place, providing treatments that restore balance into people’s lives. Water is an important element adding to the ambiance, including a beautiful, outdoor hot tub. A spectacular indoor water feature sends a stream of water flowing under a glass floor, connecting our two Serenity Lounges at the entrance to treatment rooms. All are lovely spots for a cup of tea before or after a treatment. 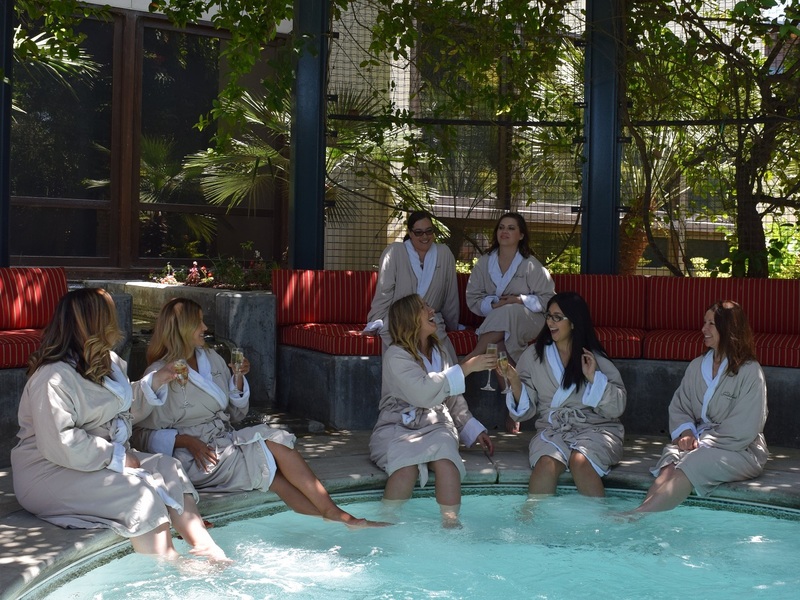 The easiest way to reserve your amazing Sandalwood Spa experience is by calling our team at 805.343.7520. Our seasoned experts will work with you to schedule your basic needs or develop a day you’ll never forget. All massage and facials services include use of our semi-private garden hot tub, Serenity Lounge and eucalyptus steam room as well as a complimentary glass of champagne, mimosa or specialty hot tea service. Please be sure to bring a swimsuit with you if you would like to utilize the hot tub during your visit. Please arrive 30 minutes early. This will allow you enough time to rest in our Serenity Lounge and enjoy the steam room or hot tub in the garden before your treatment. We provide all Spa guests with daily use of a robe, slippers and all necessary amenities. A private locker is available to store your belongings. Gratuities are at the discretion of the Member/Guest. It is customary to provide a 15%-20% gratuity for services rendered. Your treatment times are held exclusively for you. If you need to reschedule your appointment, please contact the team directly with a 24-hour notification for individual treatments and 48-hours for Spa packages. Cancellations, changed or missed appointments will be charged 100% of the treatment price when notification times are not met. Treat a friend, surprise a loved one, or congratulate a teammate: go ahead, brighten someone’s day! Our eGift cards work just like cash and can be redeemed at Sandalwood Spa, Adelina’s Bistro, and The Market Place. They can be used towards food and beverage, spa treatments, apparel, and more. Select your chosen eGift value, click on the shopping basket to check out, and email or text the eGift card to a recipient instantly! For a truly personal touch, email it to yourself, print it out, and wrap it up! Sign up to receive email specials from Sandalwood Spa.